I like making gifts, and everyone is used to receiving machine embroidered objects from me--pictures of pets embroidered on pillowcases, recipes on tea towels, flowers on sweatshirts, silly sayings on T-shirts, machine-embroidered lace ornaments and scarves. My Threadville friends have attempted to teach me knitting, and I like it, I really do, and when I saw Opal arm knitting during storytelling at her shop, Tell a Yarn, last night, I knew I had to try it, and maybe I could make a different sort of gift for friends of relatives. Arm knitting is different. Instead of inserting pointy needles into loops of yarn and grabbing yarn to pull through those loops to make new stitches, you get to use your fingers, which are much better at grabbing than knitting needles are. I bought the appropriate yarn from Opal and returned home to try it myself. No one would laugh at my failures because no one would see them, right? I managed to cast the stitches onto my right wrist, and to knit the first row to my left wrist, and was halfway through the next row, with parts of scarf hanging from both wrists and my hands basically tied together, when my two cats, Mustache and Bow-Tie, woke up. My yarn, one of those zigzag-wrapped "balls" with yarn coming off both the outside and the inside, was on the floor between my feet. Next thing I knew, my ankles were tied together, too. And that's when Clay showed up at the sliding glass door of my ground floor apartment. His knock woke up the dogs, Tally-Ho and Sally-Forth. Barking and wagging their tails in excitement, they rushed to the door. The ball of yarn, unwinding, went with them... And so did I. Shuffling. Clay came inside. When he stopped laughing, he gave me a very nice kiss, and then he began trying to help untangle my feet, but between the dogs crowding him for attention and the cats using the yarn as a soccer ball, I merely became more and more tangled. And that's when there was another knock at the door. "Come in!" I yelled. I was in no condition to walk, let alone open the door. Vicki Smallwood, Threadville's Chief of Police, and a friend, came in and stopped, her mouth an O. "What am I interrupting?" she demanded. "I can come back later." She set an envelope and a cute little fruitcake in a pleated paper cup on my kitchen counter. "Merry Christmas." "Arm knitting," I managed. "Don't go." "Harm knitting." She shook her head. "I've threatened to cuff you for interfering in murder investigations, but really, Willow, there's no need to cuff yourself." She stared down at my ankles. "Leg shackles, too. Again." Have you ever embarked on a holiday project that went awry? Tell us about it in the comments for a chance to win your choice of one of Janet Bolin's Threadville Mysteries. 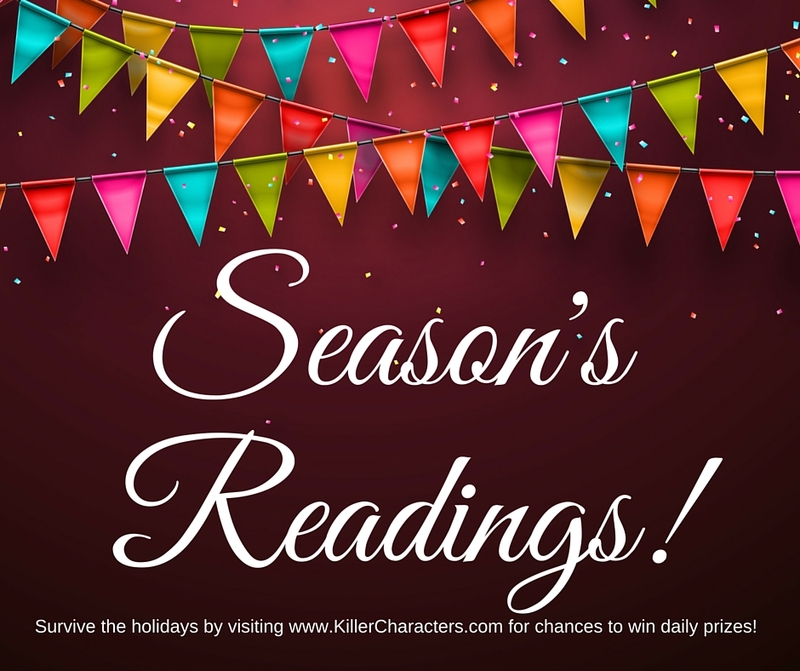 Season's Readings from Killer Characters! Like Janet on facebook, follow her on twitter. I try to protect myself and the world from Christmas projects! LOL, My only holiday project is baking cookies. I look forward to doing that every year. 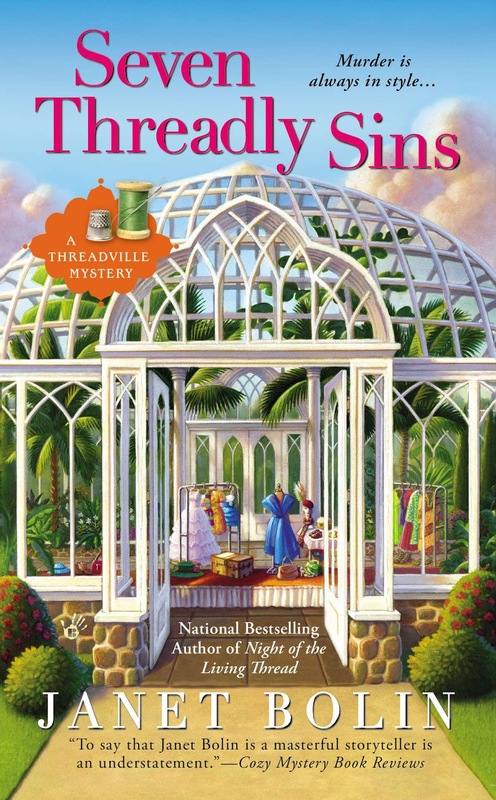 I love the Threadville series. I still have a Christmas ornament project sitting unfinished in the closet that I started 20 years ago. Do you think it's time to throw it out? What a funny post! Thanks for the morning laugh. Years ago I was very frustrated because I had decided to sew something and thought I had enough material but the pattern wouldn't fit. My sister rolled her eyes and turned some pattern pieces over. Oh. Did a lot of holiday craft projects and gifts when the kids were little. Stopped doing them when the kids were older but they projects still looked like little children made them. I am much better at reading. Thanks for the giveaway. I love seeing the "fail" photos and videos people post showing their actual results following those food and non-food projects that seem so doable. Where do I start... Started a huge crewel embroidery picture in the mid 70's. It still sits unfinished in the closet to this day. No, I have no crafting/creative talents whatsoever. No one in my family is gifted that way either. One I decided to knit scarves for the girls at work. I had to have my sister help me get them done on time. Della at deepotter@peoplepc.com Had a young friend who loved York Peppermint patties. She had just gotten married the month before Christmas so I decided I would give her a set of 4 canisters with the recipe and ingredients for making her own peppermint patties. I tried and tried to get the canisters to come out with out smudges or wrinkles after 4 tries I threw in the towel. Literally. I bought a basket put in a table runner and matching napkins. The recipe and the ingredients to make the first batch on top of those. I once decided to embroider a Calendar and after bandaids on practically every finger and great knots everywhere I decided I was not the type. I admire the work of others though...thanks for the contest. Can't think of anything holiday wise. I tried to knit once but couldn't even figure out how to get started. I did a little better at crocheting but it tended to unravel while it was still on the hooks. I can do stamped cross-stitch, though. Oh yes! A co-worker and I decided to bake cookies for the whole office decades ago and we sweated over it only to discover that the people we wanted to treat were all on diets. Making my own cards. It wasn't so much that it went awry, more that I didn't plan enough time to do it! I decided to crochet some ornaments. The pattern I picked had a few mistakes. I did try sewing blouses for my sisters and my mom one year. Not my best work, really. Oh, well. They were very nice about it. I haven't done any Christmas projects forever, but I have one coming up for a present, and I have my fingers crossed it will go well. PS I've heard about arm knitting, but it sounds like a huge challenge, especially since I don't knit. I have a Christmas wall hanging that never came out quite right. We bring it out every year & have a good laugh. I love this series, and this little snippet made me laugh! One time I wanted to make cute stocking stuffers. I decided I wanted to make those fancy bags with the chocolate covered popcorn. So I popped up a lot of popcorn and melted chocolate. Then I started ( or attempted to) cover the popcorn. On the first try I had a big goopy mess. Then I tried to drizzle the chocolate on the popcorn. That didn't work either. After about a hour or two I decided to give up on the chocolate popcorn. So I ended up making those popcorn balls. They turned out great! I was upset that I hadn't come up with that idea in the first place! Thanks for the chance to win! I was crocheting aan afghan while watching a really good movie and kept dropping stitches and didn't even catch it. My afghan looks like it has a mermail tail! I love this scene, it just sounds like something that would happen to me. I am embarrassed to talk about the unfinished projects I have hanging around, but specifically Christmas...that would be the tons of Christmas cards that I start writing but never get around to finishing! What wonderful comments from all of you! I had lots of fun reading them. We've all found creative ways to, um, frustrate ourselves and start over, haven't we? The random number generator chose CJReynolds as the winner. 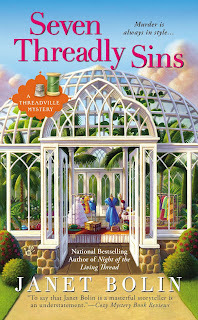 CJ, please contact Janet at Threadville Mysteries dot com. 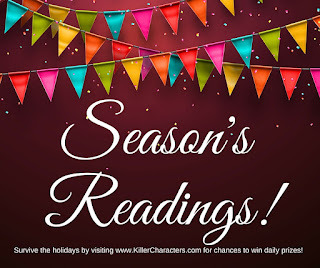 Season's Readings to all!